You've just stumbled upon (intentionally or maybe not so) the website of guitar player Vladimir Glavchovski. Make yourselves comfortable and browse around the site!I hope you enjoy it! CHECK OUT VIDEOS FROM GIGS ON THIS AND THE MUSIC PAGE!!! LATEST NEWS JUNE. 23. 2017!!! Check out the new EP release by Lexisugar titled "The Journey". Vlad plays all the guitars on the second track "All My Love"! Doors: 3:30 PM Showtime: 4:15 PM Tickets: $20 advance/$25 day of The DMV's first annual female-fronted music festival, brought to you by project HERA, a nonprofit supporting women of all ages in music! Mind Traffic(featuring Vlad on guitar,Jeff Lee on bass & Dan Boothe on drums) will be hitting the Bangkok Blues again with their signature brand of instrumental fusion on Wednesday January 17, 2007.Show starts @ 7 p.m. and it's a whole night of Mind Traffic, no opening band! 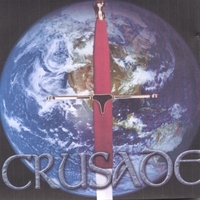 The "Crusade" CD is now also available for download from iTunes or streaming from Spotify . Buy the Crusade CD on iTunes here!!! bassist extraordinaire Geo Alexiev titled "Crusade", which is available to purchase on CDBaby here!! !